It had to be done - using your arduino to cheat at your favourite game. What do you do when the most simple game gets so frustrating that you just want to do whatever you can to get the highest score possible to boast to your friends - connect an arduino device with a few electronics to simulate touch events and sit back and watch! Valentin Heun, a PhD student at MIT Media Lab has done exactly this - to the point where he has been able to tweak his arduino code to obtain a high score of 2417 points. The setup (code hosted on github) relies on a few relays, NPN transistors to simulate touch events and a photo transistor for identifying patterns to determine what do do in the game. A full video of the high score feat is available on vimeo.com - it is mesmerising to watch. 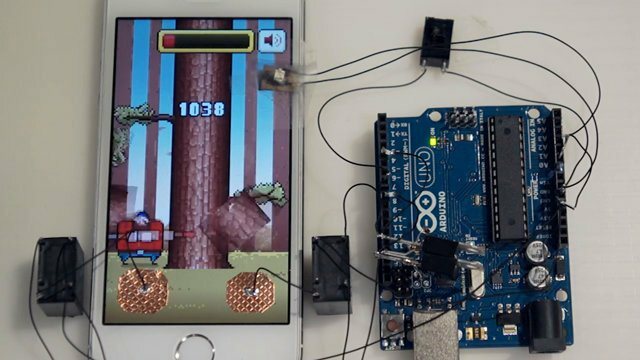 While the Timberman game is quite simple, one cannot think about how one could connect the same type of configuration to beat the famous Flappy Bird game that became an Internet sensation earlier this year - it would require some fancy logic but surely not impossible.